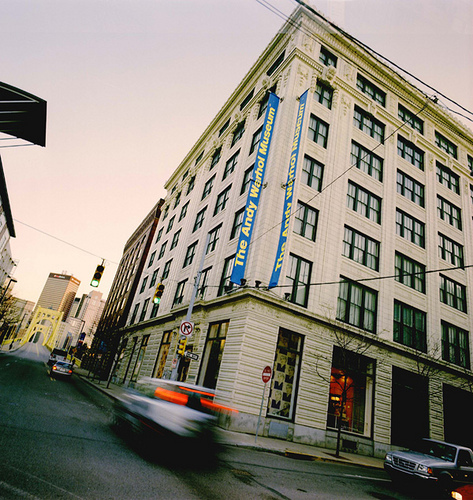 The Andy Warhol Museum is a vital forum in which diverse audiences of artists, scholars, and the general public are galvanized through creative interaction with the art and life of Andy Warhol. The Warhol is ever-changing, constantly redefining itself in relationship to contemporary life using its unique collections and dynamic interactive programming as tools. Admission includes all permanent and special exhibitions, daily film + video screenings, daily gallery talks, and The Factory. Andy Warhol was a man with ideas and a personality that blew people away. Andy Warhol’s art work has become a large part of american history not only in art but also in pop culture. Most educated people would instantly associate this artist with Marilyn Monroe, Campbell’s soup, and brillo pads. The most fascinating fact being that he had very little interaction with the creation of the pieces. Andy Warhol’s work was created in a factory by many people. Imagine being famous artist and actually having a factory create your work. His work is so inseparable from him. I high recommend learning about him, his life, and his work. He was an interesting man who was famous for his art, quotes, and his over all presence. The employees were so impressive. They were readily available for questions and conversation. They were so personable and yet so knowledgeable about the work. Maps and general information on the museum before you entered but the front desk was so helpful on the best plan to travel through the museum. In this museum you begin on the seventh floor and proceed by working your way down. The floors were small which gave you the opportunity to view each piece pretty quickly. Although I attended on a Saturday crowds and flow were not really a problem. Museum signs were not that prevalent but because of the stated order of the floors you view there was not a true need. A photo booth was located on the first floor. The booth provided images with a pop art theme that compliment the work within the museum very well. On their website they have come up with multiple ways to stay connected and relevant. In the museum industry its hard to make something like art stay current when new work is being produced each day. Check out their other ways to connect on the website.